Reflecting back on the adoption process there is one thing that was almost as bad as being chemically altered by hormones and that was completing the home study. I did not like the adoption home study process. Let me repeat. I did not like the adoption home study process. The thought of having to prove that we were worthy and capable of taking care of children to someone who has met us twice and only really knows us from the documents required was very stressful to me. The process was especially frustrating when I would hear of another baby born to an unfit parent. I didn’t understand why we had to prove we could raise a child and others, who should never have a child, popped kids out like a Pez dispenser. Logically, I understood why we needed to go through the process, but emotionally, I had trouble. We started the process in November and finished in early February. I don’t know if that’s a normal time frame, but for me, it felt like forever. The first part of the process was finding an agency in Kentucky that didn’t cost an arm and a leg and who had some clue about embryo adoption. Bethany Christian Services is linked with the NEDC, but at the time, they were not licensed to do home studies in Kentucky. I talked with numerous agencies and they had prices from $1500 – $3000. Three grand sounded like a racket to me, so we opted for a less expensive agency with a flexible payment arrangement. Adoption Assistance was recommended by a friend from work, so we decided to work with them. They were extremely patient with my unending questions — I didn’t want to screw up anything. I began to gather all the required documentation, which included financial statements, employment verifications, criminal and child abuse background checks, birth certificates, medical exams, reference letters and so on. We had to disclose any arrests even if they were no longer on record and lo and behold, Jeremy was arrested when he was 19 years old. I believe the exact charge was “young and dumb.” Since it was disclosed, I had to go to our court house and get a letter stating that there was no longer any record of this arrest…I can say I didn’t exactly fit in with the rest of the people getting arrest records at the courthouse. Another hoop was required to jump through because at least one of my reference letters mentioned our pets. Because of this, we had to provide records of their rabies vaccinations as well as a letter from the vet stating that none of them, including our dopey beagle, were viscous. Our cats were due for their shots and I was determined to get this home study completed, so at the beginning of our historic ice storm in January 2009, I carted them to the vet’s office for their shots. Thankfully, I didn’t slip and break any limbs. Even though we were going through embryo adoption and child-proofing our house wasn’t going to be needed for some time, we had to childproof the house. I think I made at least three trips to Target to get the right things to lock certain doors or cabinets. I guess it’s one thing we won’t have to worry about once we are in need, but I found it odd to be going through the exercise when the need was likely at least 18 months off. We met with our home study case worker twice. The first time, she interviewed us individually and together. Jeremy said she asked him if he really wanted to do this, because sometimes husbands get drug along for the ride and really don’t want to adopt. She also asked us both what our wedding anniversary was and how we met. Thankfully, our answers were the same. Additional questions about our upbringings and desire to adopt were asked. The second meeting was at our home where we discussed positive adoption language and our house was inspected to ensure we had adequate shelter and baby proofing. After this second meeting and providing an inch thick stack of paperwork our home study was written and sent to us for review. I have to admit, we sounded like saints and soon my fears of getting denied started to go away. Once Adoption Assistance blessed us, our home study was sent to Bethany Christian Services to be reviewed per the NEDC’s requirements. Within a couple of days, the NEDC was notified that we were approved and we could finally move on to the next step which was scheduling our first trip to Knoxville. I was so relieved to have this part of the process completed. To me, it was forward progress to the goal. Our first appointment with Dr. Keenan was scheduled for May and I could actually relax…at least for a few weeks. Friend of the family, Sheila Riche, publishes the fine blog Placing Parents. We recommend it for embryo recipient families and embryo donors. Her most recent entry reminds that every step of the process, for every person involved, involves strong and sometimes surprising emotions. If you find yourself in distress, please don’t be alone with your sadness or frustration. Reach out to your doctors or those who counseled you during your adoption or donation process, to find experienced hearts who can help. If you don’t have access to those resources, contact NEDC and we’ll do whatever we can to lead you to reliable support and advice. Until this past weekend, I hadn’t exercised since April 12. My last exercise session was a swim that was cut short due to contractions. Other than taking the steps and holding my breath to avoid the smell of urine in the hospital parking garage physical activity was non-existent for me. In the last two weeks, I have started to crave movement, but was leery to do too much because of my incision. I didn’t want to push it too fast and end up blowing a stitch or causing other injury. Plus, the weather around here had been less than cooperative, so getting outside wasn’t really an option. All that changed this weekend. 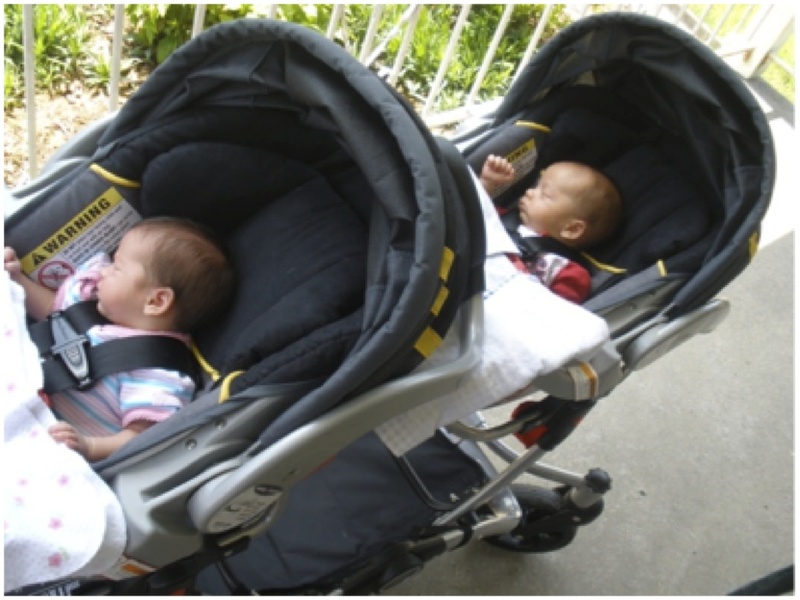 We decided to break out the stroller and give the babies their first taste of the great outdoors. The temperature was in the 80s and the sun was shining brightly. We live in an area with lots of parks and easy access to walking paths. Saturday morning we loaded the babies into their tandem stroller and hoped they were properly strapped into the monstrosity. Our dog, Charlie, was leashed and pumped to get a walk (he would later change his mind once he realized the distance). The path we chose is three miles round trip with several good hills. I estimate that the stroller, plus car seats, plus kids equals at least 60 pounds, so I was in for a good workout. Less than a half mile from home, it became apparent that it had been almost 6 weeks since I’ve done any cardiovascular activity and we thought about altering our route (actually, I thought about it and Jeremy laughed at my struggle). But, I persevered and we continued forward. We hit our first hill and I had to really lean into and Jeremy was concerned about my incision. I told him it didn’t hurt and I was going to continue on. Even though I’ve lost more weight than I gained while pregnant, I’m still motivated to get everything toned back up. Any core strength that I once had was obliterated with two babies ripping my abdominal muscles apart. I’ve committed to return to instructing yoga in July, so I need to make sure I can actually complete one of my routines and building back my core and cardiovascular strength will help immensely. Forty-five minutes after leaving home, we returned to the driveway sweaty and tired. Both babies were thoroughly unimpressed with the adventure as they slept the entire journey. I didn’t blow any stitches and didn’t hurt. It felt great to get moving again. The trip was also successful because we didn’t cause any major accidents. Both of us are extremely fair skinned – me because my brother stole all the pigment from the womb and Jeremy because he’s worked third shift for 4 years and slept while the sun was out. I figured with our extreme paleness that we would have caused passing drivers to be blinded by the light and careen off the road causing mass chaos. Due to the success of the trip, we ventured out again Sunday and will be heading out again today. Cheers to my mental and physical health! This weekend we got to keep my niece, Caroline. I remember when Brian and I were trying to have children and Caroline wanted to know why we wanted any since we “had” her! She had a long time to get used to the idea of us having children, so by the time I was pregnant she was very excited. She named the twins “HOPE” and “FAITH” while they were still in my belly. I think she was hoping for two girls, but she sure is happy with them both now. The best part of the weekend for Caroline was watching Julian eat the fries she gave him at DollyWood. Caroline would hold one out to him and he would try and get it with his mouth. Then when one fell, he said “Get, it, get, it.” He loved them so much he wanted to eat every last fry! Brian and I voted Natalie eating the cherry on the milkshake as our favorite moment this weekend. She had never eaten a cherry on a stem before and she just acted like she knew exactly what she was doing. Once she ate the cherry she used the stem as a spoon to scoop up the whip cream on the shake. She loves whip cream just as much as my Mom did and that is a lot! We had such a great time at DolllyWood and enjoy every moment we get to spend with our twins and Caroline too! We are so blessed that she loves them so much and is so good to them. I was thinking about Marti’s latest blog entry regarding personalities the other day, and I have to laugh when I think of that little slip of a girl telling the boys how it will be done already! She it just too cute. It is a good thing Julian has found something to amuse himself with (his passion for cars), because she is busy running the show! I’ve oftentimes wondered how much of an affect nature has on our personality development vs. nurture. We’d mentioned after we agreed to the open adoption that it would be interesting to see. I see a strong resemblance not only physically between Julian and my boys, but with likes and dislikes as well. Can this be attributed to coincidence, or something more? My husband as well as my boys are drawn to anything fast and motorized. As for Miss Natalie, she reminds me of my nieces when they were toddlers and young children. They were (and still are) confident in themselves, and would lead the pack despite the activity. Was this confidence a learned behavior, or was it inherent? I personally think an individual’s personality develops as a combination of the two factors. You have to start with something (nature, i.e. like/interest vs. dislike/aversion) and develop that by pursuing activities and the like to cultivate it. In order to make something, you need to have the ingredients; what you end up with depends on how they are mixed. Another thought if you want to argue nurture as being the deciding factor. Marti and my sister are very supportive and encouraging in their parenting styles. Could it be this support and encouragement that is the wind beneath their wings? On Mother’s Day weekend we got to visit the Rose family. We had not seen them in many months since they live in Missouri. JT had lost 30lbs in three months, he looks great. JT told us that he has started a fitness program called “P90X.” He is following the program for people who have to lose a lot of weight or want to get back into competitive condition. His workout program consists of working out two hours a day six days a week and I cannot seem to find time to work out at all! Seeing him really motivated me so much that the first week I got back home, I visited Krispy Kreme and ate a massive amount of sweets, not too different from my normal week. Then I started praying about it and this week I have started my own workout program two hours a day. On Monday I was going to get up at 7am to work out before the kids woke up. That did not happen, since Julian was in our bed sleeping due to being up the night before with gas pain. I decided that after their breakfast I would do one of my videos and they could play in the room. I sat them in their chairs and it worked really well for about five minutes. Then they were up and wanting me to hold them. I tried to encourage them to do it with me, but Julian just attached himself onto my legs and Natalie climbed on my back; all of this while the dogs were licking my face! I gave up and decided to finish it when they went down for nap. I did finish that video of 45 min. and then I did my Bible study. When Brian got home, I then did another video that lasted 30 min. I hoped to do a third one when they went to bed, but I was just too exhausted at that point. So the first day of my workout routine was not quite a success. I was only able to get half of my goal done. Today I have done a 25 min. video and will now go do the 30 min. one as well. If I get the other hour in today will be anyone’s guess! It’s been a weekend of firsts at the Wilson house. Friday we got to bring the babies home. We learned of their potential Friday homecoming on Thursday afternoon. The doctor asked what we thought about going home (of course we thought it was a great idea) and said that if they had a good night and passed the car seat test they could break out. You can imagine our excitement and anxiousness at this prospect. It only took one “event” (heart rate drop, huge spit up, etc) to keep them in the hospital. I cautiously called the hospital Friday morning and was told that everything went well and they were awaiting appointments to the cardiologist and then they would be discharged. We arrived at the hospital at 10:45 and signed a ton of paperwork and returned to our driveway by 12:00. We had two bags full of hospital swag and several doctors appointments scheduled for the next few weeks. It was great to have them home. Our first night was a bit chaotic feeling as the babies were on different feeding schedules. We somehow managed, but at some point in the night, I think we both wondered why the hospital let us have take them home…were we really qualified for this? We didn’t anticipate the level of noise emitting from these kids…not crying, just noise. Jeremy said they sound like they are tuning into some chipmunk mother ship. Day two was another first as we took them to church for the first time. Our trip wasn’t a total failure as we were successful in making it to the service on time, but we landed in the cry room due to Maria’s grunting and gurgling. I guess she didn’t like the preaching. Mom has offered to watch them this weekend as they are still a bit young for the nursery, plus being preemies they are more susceptible to infection, so we want to let their immune systems get on board a little better before exposing them to a bunch of snotty babies. We were a bit more strategic on the second night and worked to have them eating within the same hour. It worked and I think we got several solid blocks of sleep. We learned they like to cuddle with us and if they were fussy, but not hungry, pulling one or both into bed worked well to calm them down. We have them sleeping in a little sidecar bed in our room and the proximity is very convenient for nighttime feedings. We had a much anticipated “Welcome to the Zoo” party with my family on Sunday evening. It included a feast of king crab legs and scallops care of my brother’s recent trip through Alaska. We were out a bit late and realized that getting home early was necessary for Grant and Maria not to be overtired and unreasonable. All is going well on the Wilson home front. I was hoping to stroll the kids up to the voting booth to have their first civics lesson today, but the weather is looking a bit dubious, so I didn’t risk it. I opted for a 2 minute drive by myself to the voting station. I think the average age of the voters and poll workers is about 106 in my neighborhood. Unlike many in my age group, I hope that Grant and Maria take their civic duty seriously when they are of voting age. For now, we are just thankful that the always horribly timed political phone calls will stop…at least until October.